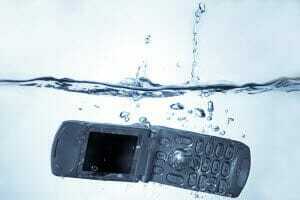 Time for the Truth: Can a Water Damaged Phone Be Repaired? 1. Some of the non-motherboard components get damaged. This might be the battery, screen, power button, charging port, etc. These are generally pretty easy to replace and not a problem if you can identify which components are bad. 2. Some of the components on the motherboard get shorted out and damaged beyond repair. This basically turns your phone into a paperweight (you can do some soldering tricks but they aren’t usually economically feasible). 3. Some of the wiring on the motherboard corrodes and creates a shortage with other wiring. This is often fixable – at least in the short term. The really bad news is that even for the best cell phone repair businesses an initial success rate of 70% would be considered good. Unfortunately, about 1/3 of all the phones that leave the repair shop in working order will come back within a month presenting more problems. You see, that’s the biggest problem with water damage. It doesn’t all happen at once. Think about it like a rusting car. Your car doesn’t rust the first winter you drive it on salt covered roads. But after 10 years of winter driving you start to see rust. Then, every year a little more rust appears. It develops slowly over time. The same thing happens with water damaged cell phones – only instead of years we’re talking weeks. You can clean them out using a sonic cleaner and electronics safe cleaning solution (the preferred tools of a professional shop). That might remove 95% of all corrosion and debris. But that other 5% doesn’t stay put. Like rust on a car, it slowly starts to grow over the course of a week, a month, or 3 months. It will begin to spread until one day your Wi-Fi won’t work, your camera goes out, your phone stops charging, the screen goes black, or some combination of all those things. When you take into account all the problems that can happen after a “successful” water damage repair, most companies would be lucky to have a 50% success rate. So that’s why the warranty policy is so important. You don’t want to spend $120 on repairs and two weeks later have to buy a new phone. Whatever you’re looking for, you should be aware of all the possible problems that can occur even with a professional water damaged cell phone repair. And don’t forget to always ask and get in writing how a repair shop’s warranty policy works when you first take it in for repairs. Is One Samsung Repair Center as Good as the Next?